Many cities such as San Francisco face a multi-dimensional housing crisis, with large portions of the population heavily burdened or priced out of ownership by housing costs, unable to find appropriate housing, or facing onerous transporation expense and stress. However, while urban housing is highly controlled, expensive, and inaccessible, large areas of adjacent, valuable public space is given away for uncontrolled, free parking. As has been argued most influentially by Donald Shoup in The High Cost of Free Parking. (2005), this practice amounts to an extraordinary privileging of private automobile use over other goals such as housing affordability, pedestrian / bicycle / transit use, street-level livability, or environmental sustainability. Shoup and other reformers advocate more appropriate pricing of parking, or even the conversion of spaces into “parklets”, i.e. tiny parks featuring planters, trees, benches, café tables with chairs, fountains, artwork, sculptures, bicycle parking, etc. 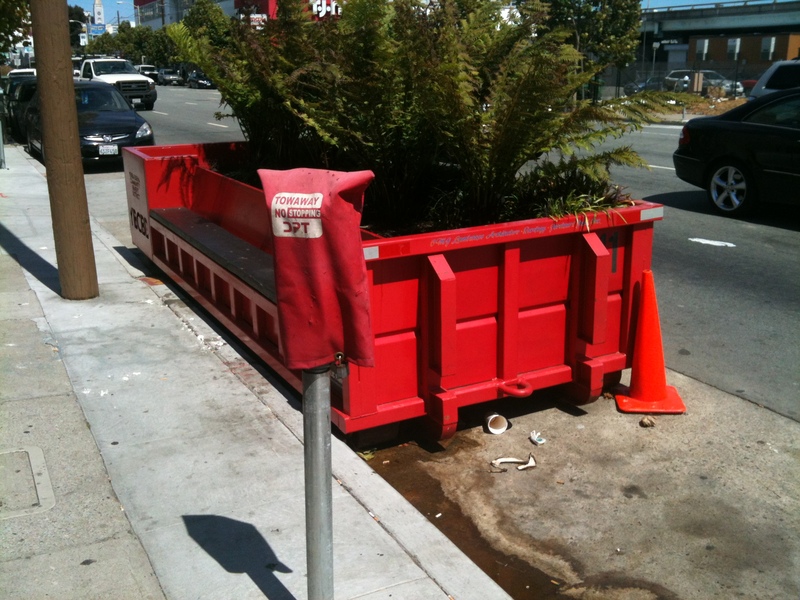 A parklet on Valencia Street in San Francisco. However, why not take this idea to the logical conclusion and put actual housing units on parking spaces? 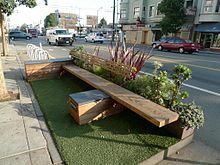 New York, San Francisco, and other cities are already reallocating scarce parking spaces for parklets and benches, so why not try using these spaces for something potentially far more valuable: compact mobile housing units? Naturally, in the U.S. most people would immediately ask, who would ever choose to live in units with a footprint of a parking space, 8 feet x 10-16 feet? First, millions of Americans, and billions of non-Americans, already do live in such spaces: they’re called bedrooms, dorm-rooms, hotel rooms, hostels, mobile homes, etc. I myself live comfortably in a converted 1-car garage of 200 square feet, which allows me to live inexpensively near downtown in super-expensive Palo Alto. Parking-space units could also be multiple levels high, and/or span multiple parking spaces. Secondly, generations of tinkerers and homesteaders have been building and living in tiny houses in back yards, and on vacation properties since, forever. In the last 10-15 years, this has exploded into an international high-design lifestyle movement, and now a steady sub-genre of architecture book publishing. 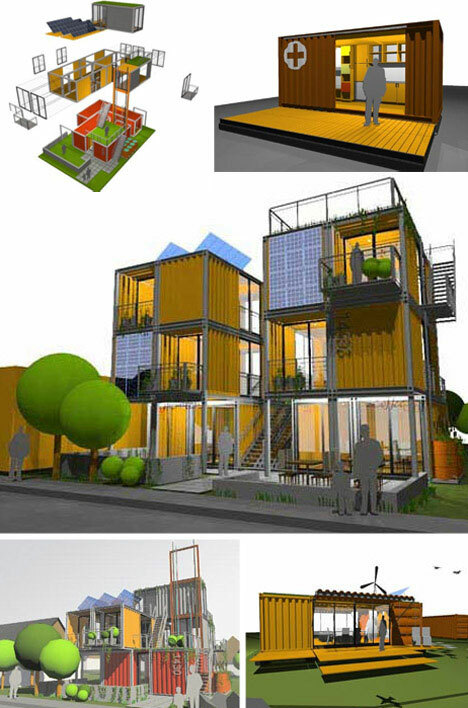 Often, tiny house concepts overlap with mobile and modular design, for example in the thriving architectural sub-field of shipping-container-based housing. 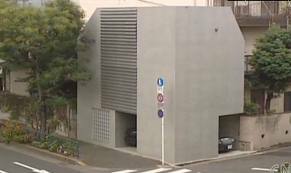 A much-reported case of housing specifically built on a “parking space” is the Fuyuhito Moriya’s house in Tokyo, built on a 30 square meter area formerly used for a parking space. Getting us closer to mass production and mobility would be SnoozeBox, the UK-based company that offers popup hotels assembled from room units made of converted shipping containers. 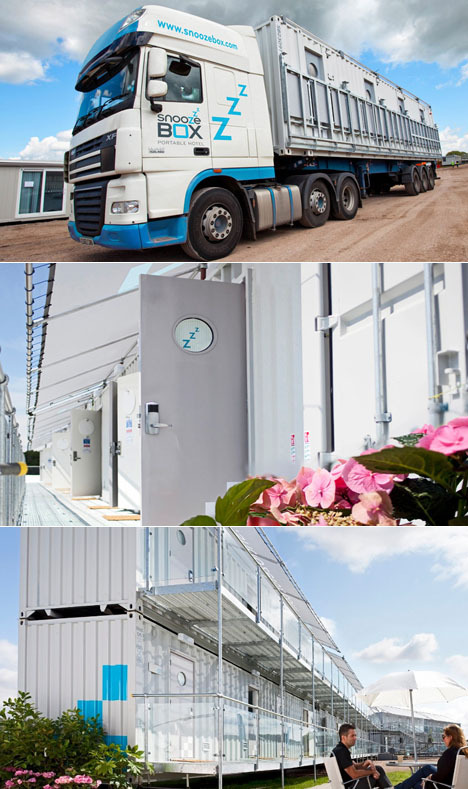 In their case, 40-foot containers (2 TEU, in shipping-industry parlance) are used, each containing multiple rooms. Nobody in the U.S. would live in a housing space on top of a parking space? Who knows, why not try it? Presently, paternalistic housing regulations mandate, for Americans, minimum living spaces that would be considered luxuriously expansive to much of the world’s population. Meanwhile increasing portions of the population, particularly the young, face prohibitive obstacles to renting or owning property, particularly in the concentrated urban areas where most job growth and career advancement is available. Personally, I think that a highly affordable cabin located in a vibrant part of a central city, which I can relocate or put into storage as needed, seems radically unconstrictive compared to being trapped in a rental costs of 50% of my income, or in a 30-year mortgage, or worse, stuck with underwater property after a housing market collapse. Already in New York and San Francisco, traditional housing-space requirements are being challenged by officials, developers, and housing advocates as obstacles to supply and affordability. 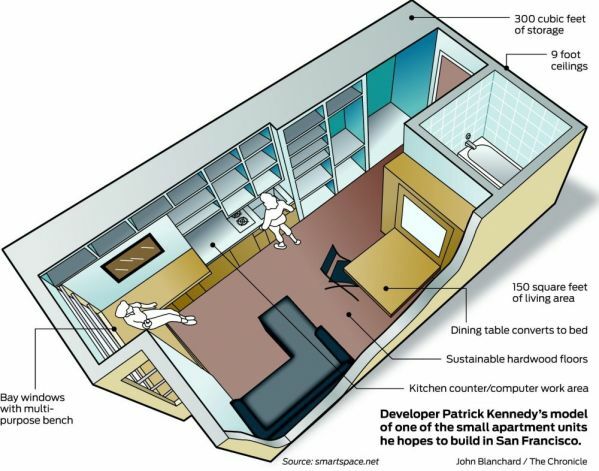 Berkeley-based developer Patrick Kennedy of Panoramic Interests is advocating new buildings of 160 square-foot apartment for the SoMA area of San Francisco (see diagram at left). give or rent parking spaces out to homesteaders willing to design, build, and live in Parking Houses. Taking a cue from agile software development, we might call this approach “agile housing”: build small, fast, and flexibly, don’t try to discover and fulfill every possible requirement at the outset. Decades of experience and studies in software engineering have shown that iterative, adaptive development is often more effective, or even the only possible approach under conditions of high-uncertainty mission or environment. Analogously, why should we build only with fixed forms? Building for fixedness, like trying to completely specify complex software systems at the outset, creates high costs and risks or failure or underperformance. Applying this observation to cities is as old as software development, as it happens. In particular, two 1960s radical architecture movements, Archigram in the UK and Metabolism in Japan, envisioned and theorized (and occasionally built) a city environment in which many or all components would be movable, adaptable to changing needs. Visionary architects have been rediscovering and extending these ideas ever since: for example, Andrew Maynard’s Corb 2.0 housing system, which uses standard industrial container-handling equipment to make a reconfigurable block. Addendum: see also my followup post “Parking Houses and Houselets: Critical Followups” in which I respond to a set of questions from Allison Arieff of SPUR / NYTimes. thanks to Romy Ilano for ideas, pointers, and conversations about rethinking health and urban space. 2. Shoup, Donald. The High Cost of Free Parking (2005). I have always enjoyed the attitude of the Japanese Metabolist architects, especially. Nice post. I should point out that in Vancouver there is a big program of back lane housing that is essentially housing on parking spaces, and in San Francisco after the 1906 earthquake, a lot of small houses (Type A's were 10 x 14, even smaller than a parking space) were built and quite a few are still standing and being used. It is a precedent right in town.